There is a cycle, and the sight of a man falling from it is often hilarious. Writing about it, on the other hand, is less so. Explaining a joke — especially a bit of timeless slapstick, as with the bicycle — immediately renders it less funny; imagine the difference between reading a comedian’s monologue and actually experiencing him hurl out the syllables at you, standing-up for his punchlines. Given this ephemeral nature of comedy, which relies on so much from timing to delivery to context to flair, it is thus even harder to try and bottle down the impact and influence of a sparkling comic writer on generations that have grown up snickering at his words and his films. It’s hard to explain how much Harold Ramis mattered to us, and to the men who make us laugh. Ramis was a killer writer, a sharp and incisive satirist with a goofy good-naturedness amusingly at odds with his fanged barbs. The balance made for movies that were almost entirely quotable and yet heartwarming, sometimes even inspiring. The pithy rarely found such empathy, especially in Hollywood. And so he wrote movies that shaped different comedic fashions of their time, like The National Lampoon Show, Meatballs, Caddyshack, Stripes right up to Analyze This which, despite its dated schtick, has fantastically funny bits. These weren’t just hit movies, or movies that turned actors into stars — Bill Murray, for one, owes a lot to Ramis — but they were movies that inspired comedians to go out further on a limb, try harder, be more accessible, make their jokes land better. The ripple effect — through comedic directors like Judd Apatow, Jake Kasdan and many others who openly call themselves disciple of Ramis — has been coming to us ever since the late 70s. Like seismic giggles. In 1984, Ramis co-wrote and starred in Ivan Reitman’s Ghostbusters, a film where — as parapsychologist Egon Spengler — he won us over as the truly cool Ghostbuster. For those of us who, in Goldilocks vein felt that Dan Ackroyd’s Stantz was too silly, Ernie Hudson’s Winston too overt and Bill Murray’s Venkman too dry, it was Spengler who made it all matter: he was the George Harrison of the quartet. While Ramis appeared in other films, it is his wonderful character in the two Ghostbusters movies that endures. 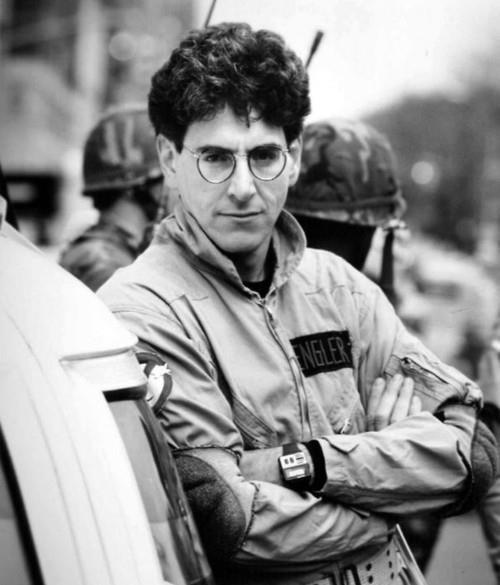 We were all charmed by Venkman, but Spengler’s the one who made the Ghostbusters feel like a real team. And then there’s Groundhog Day, a Harold Ramis film about an infinite loop — a lifetime of days that begin with Sonny and Cher on the radio and plod through the very same paces, over and over — that will surely be remembered as the filmmaker’s masterpiece. The 1993 film is an absolute gem, with Bill Murray at his best and the film managing to keep rerunning around in circles and yet staying fresh — yes, keeping repetitiveness fresh — thanks to Ramis’ deft, light touch. It is the sort of film that priests and philosophers embraced, talking about its beautiful universality of theme, about life being a series of endless variations on the same, but it is also a truly funny film. Something tells me that’s the bit Ramis, who we lost at 69, would treasure more. Just like he might appreciate a eulogy that begins where it ends, or something like it, anyway. So long, beloved Ghostbuster. Ashes to ashes, gags to gags. There is a cycle. Nicely done. In line with what you said in the first paragraph though, don’t you think links to the actual video clips to go with your dialog picks would be a good idea?